Sir Simon Rattle is one of the world's most respected conductors - but which recordings should you go for? Find out with our handy guide to 15 of the best. 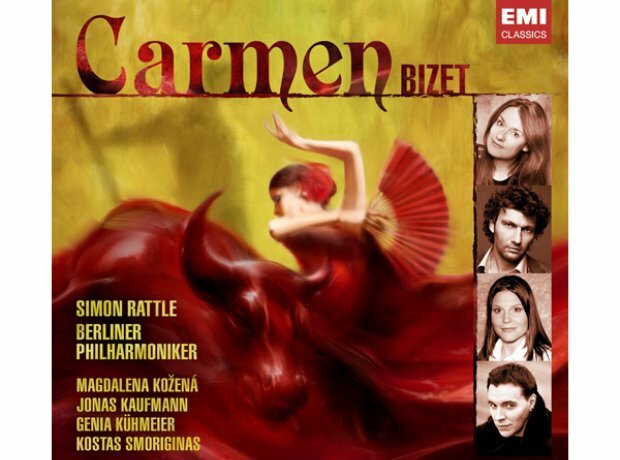 One of Sir Simon's most recent recordings, his reading of the Bizet crowd-pleaser features his wife, Magdalena Kozena, in the title role. This recording caused a bit of a stir amongst Beethoven purists due to Rattle's fiery take on the biggest symphonies in the repertoire. Expect the unexpected. This set of complete Brahms symphonies sits perfectly alongside Rattle and the Berlin Phil's award-winning recording of the composer's Ein Deutsches Requiem, capturing the romance lying deep within these huge works. This collected box set of Rattle recordings of Britten works ranges from the populist works like The Young Person's Guide To The Orchestra to some of the Great Brit's more obscure and challenging works. Another recent triumph, this fiery interpretation of Bruckner's unfinished swan song appears here in its reconstructed four-movement version, painstakingly reassembled and given new life by Rattle & co.
Again proving that the 20th century really is a speciality of Rattle's, this effervescent reading of one of Debussy's most enduring masterpieces is completely engrossing. Showing again that he really 'gets' Brahms, this is a remarkably human interpretation of a truly epic work from Rattle and his trusty band of Berliners. This is perhaps the quintessential Rattle recording. Recorded back in 1987 with the City of Birmingham Symphony Orchestra, it's considered by many to be not only the definitive Rattle recording, but the definitive Mahler 2 recording as well. Long after he's gone, Sir Simon Rattle will probably be best remembered for his Mahler recordings and interpretations. Few conductors are so tightly attached to the chaos of these gargantuan symphonies, and this relatively recent recording of the 9th shows you just how attached Rattle can be. Rattle has a fine reputation for challenging audiences with new works, and this Thomas Ades piece is no exception. The Philharmonia are wrestled into producing something quite spectacular by Rattle, clearly aiming to make the most otherworldly interpretation possible. As double-teams go, this takes some beating. The Emperor Concerto is given a fantastic, emotional and virtuosic reading here - no wonder Sir Simon look so pleased on the cover. The Rite Of Spring is a piece that naturally bursts with youthful exuberance, so what better orchestra to tackle it? Rattle expertly coaxes the most out of them too, without letting things get out of hand. Catch the Rattle/CBSO partnership in the ascendent with this complete cycle of Sibelius symphonies. The 2012 Olympic Games was memorable for a variety of reasons, but for Simon Rattle it was probably most memorable for being upstaged by none other than Mr. Bean during an unforgettable performance of Vangelis' music from Chariots of Fire.